Benchmarks for Nvidia’s GTX 1070, GTX 1060 and GTX 1080 have been spotted on the 3DMark 11 database. The entries are varied and show GPUs with performance figures that range from very high – GTX 980 Ti territory – to entries that show performance closer to the GTX 970. Before we get into the performance figures I’d like to give a shout out to videocardz who have spotted two of the four entries we’re sharing with you today. Also as a reminder, please keep your salt shaker handy at all times during this. The 3DMark entries you’re about to see do not match any current or previously launched Nvidia graphics cards. The first entry we have is of an unidentified Nvidia GeForce graphics card with 7,680 MB of graphics memory, 512MB short of 8GB, very likely a test chip. More interestingly is that this GPU’s VRAM is clocked at 2000Mhz – 8000Mhz effective. It’s a good time to point out that Nvidia has no GPUs on the market configured with 8GB of 8000Mhz GDDR5 memory. And certainly no 8GB GPUs with performance that’s nearly identical to the GTX 980 Ti. The only 8GB 900 series video cards Nvidia currently has in the market are its GM204 based mobility chips, which can come configured with 4GB or 8GB of 7000Mhz GDDR5 memory. However as mentioned earlier, neither does the GTX 980M, or GTX 980 notebook match the performance figures you see above. Which are inline with the GTX 980 Ti. So we might very well be looking at the GTX 1070 ,GTX 1080 or the mobility version of either. Also worthy of note is the 545mhz clock speed recorded above. After we’ve done a bit of digging around we found that in most cases when 3DMark does not fully identify the graphics card in question it will report a ~540mhz clock speed, despite whatever the actual clock speed of the card is. So in this case and indeed in all the following entries you will see 540mhz erroneously reported as the GPU frequency because 3DMark failed to read the actual clock speed of the card, possibly as the result of a BIOS misread. 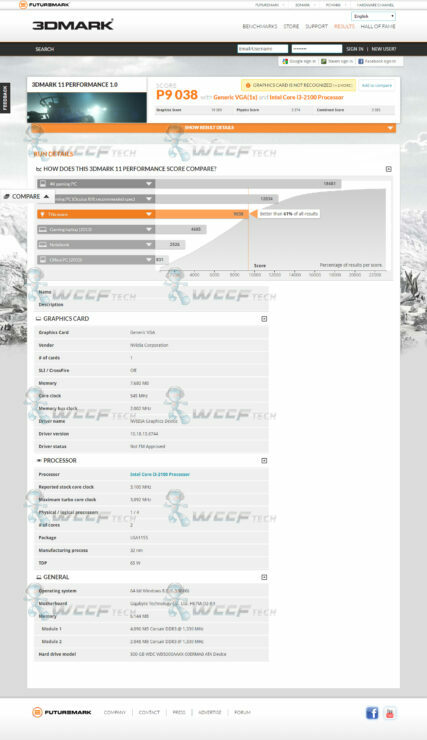 This can be confirmed by looking at some other misidentified GTX 970 and GTX 980 entries with a recorded clock speed of 540mhz. Which also happen to show performance figures that are on par with what’s normally expected of these cards at their boost frequencies. Really no where near what they would score at ~540mhz. Now let’s move on the next two entries. Again we have two cards with 8GB of 8000Mhz GDDR5 memory, showing performance that’s very similar this time around to factory overclocked GTX 970 graphics cards. So we could potentially be looking at early mobile variants of Pascal. The last interesting entry is of an unidentified Nvidia 3GB 2500mhz – 10,000Mhz effective, graphics card. So we could potentially be looking at the very first GDDR5X pascal graphics card here. 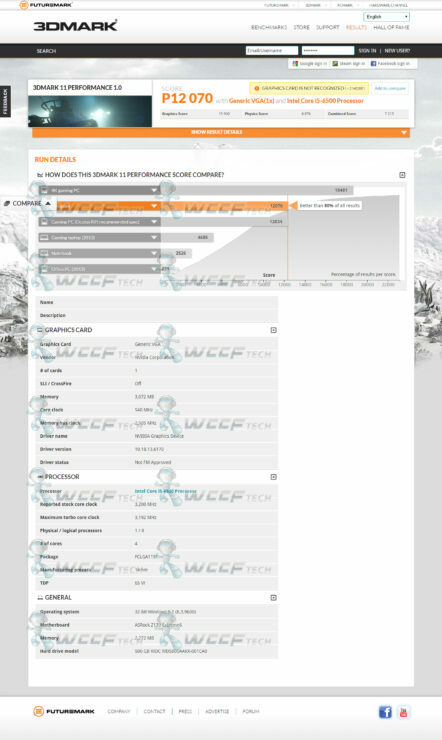 3DMark will on occasion also report erroneous memory frequency figures doubling the actual speed. However there are no 3GB 1250Mhz Nvidia graphics cards. The GTX 780 features 1500Mhz – 6000Mhz effective – GDDR5 memory and the GTX 780 Ti features 7000Mhz effective GDDR5 memory. Interestingly this card is also showing performance very similar to factory overclocked GTX 970 graphics cards. Keeping in mind that GDDR5X memory modules come in 512MB, 768MB, 1GB, 1.5GB and 2GB configurations this card could plausibly have a 128bit or 192bit bus for a total of 160GB/s or 240GB/s of bandwidth. So we might be looking at a ~ GTX 1060 class graphics card here. The fact that GDDR5X memory chips come in a variety of capacities also means that Nvidia could conceivably launch 4GB or even 6GB versions of this card. Yesterday we discussed the rumored GTX 1080, GTX 1080 Ti and nextgen Titan specs that have made the rounds on the web. Today we got to look at potential performance figures more for Nvidia’s mid-range offerings. Nvidia’s GTX 1080 and GTX 1070 graphics cards are set to launch this summer and we can’t wait to see them in action.